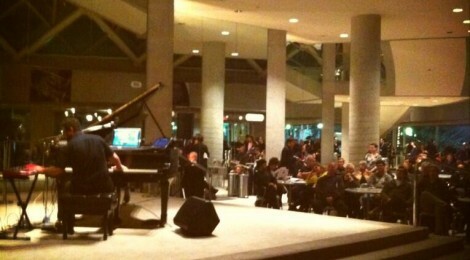 As part of my SoundMakers residency, on March 7, 2013 I performed a pre-concert set at Roy Thompson Hall, as part of the Toronto Symphony Orchestra’s “New Creations Festival”. At some point in my set I was to make a piece that incorporated sounds from the SoundMakers sample database, but it was also important that my set be no longer than 35 minutes in length, so the TSO could start on time. I am used to playing much longer sets, in which I can take my time developing ideas, exploring electronic textures, and transitioning to beat-driven pieces and of course, improvising. So I had to give it some careful thought — I wanted all of the elements of my music to be represented, but I didn’t want it to be a random smorgasbord – one of my biggest focuses is crafting cohesive set is. I decided to put the SoundMakers Sounscape in the middle of my set as a sort of ambient Intermezzo between the more energetic and intense pieces. I opened my set with a solo piano piece called “Introitus”, which employs (English style) Renaissance counterpoint, set against an arabic melody, moving into an electronic, breakbeat-driven piece “Mercurial” which is in a fast 7/8 time. Then I set aside 6 minutes for the SoundMakers improvisation. I had spent the previous weeks slowly combing over the SoundMaker’s database, fishing for ear-grabbing sounds, ones that I could imagine create interesting textures with. In the end the pieces I decided to sample were: “Breathe” for orchestra by James Rolfe; “Time Zones” for marimba by Peter Hatch; “Hex” for percussion by Andrew Staniland; and lastly Kelly-Marie Murphy’s oboe concerto “Indelible Lines, Invisible Surface”. 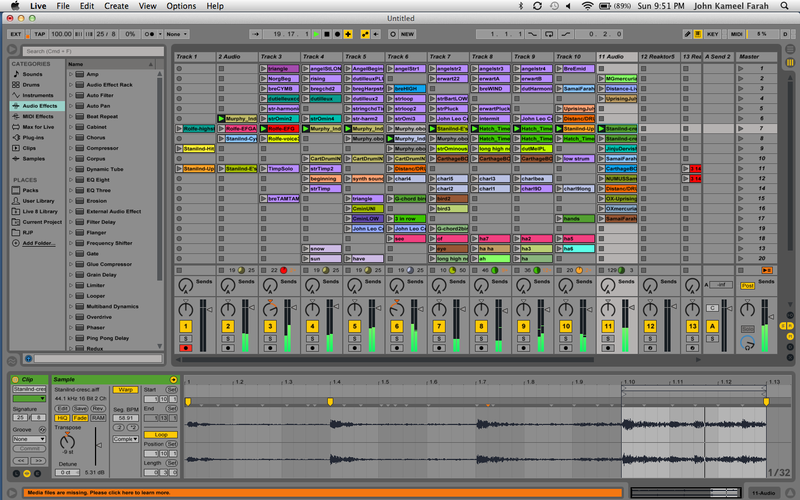 I loaded all of the samples into Ableton Live 9 Suite (courtesy of Ableton – many thanks) and experimented with looping them in various combinations. With some minor pitch manipulation I moved them towards an E-minor tonality, so that I could also do some light chordal improvisation on the piano, and route the piano sound through effects in Ableton to create a nice, thick, sonic soup. I closed my set with “Uprising”, which is in a jazz/breakbeat piece in a blisteringly fast 10/8 – a fun and boisterous way to end. I was delighted that the TSO lobby had filled up so quickly and the audience was so attentive throughout, following the music in every direction it went – I was also very happy that my older brother Chuck could attend, as he is now visiting from Brazil, and doesn’t get to see me perform very often. To give you an idea what it sounded like, here is a recording of the Soundscape below, uploaded to my Soundcloud account. The semi-improvised electronic soundscape contains orchestral samples from the SoundMakers database; samples from pieces by Andrew Staniland, Peter Hatch, Kelly-Marie Murphy and James Rolfe.